Learning how to self publish a book is much easier than you think, especially with the modern day option of self publishing on Amazon. It really is just one of the many ways you can jumpstart a business on Amazon. When it comes to starting your life as an author, getting an agent or a traditional publishing deal is mostly geared for THE ELITE. Most literary agents receive around 5,000 manuscripts a year and only take on 5 or 6 promising authors. Some people manage to find an agent and publisher. Rand Fishkin is a recent example. He’s written about it on his blog. But Rand is an exception. He’s well known (famous within the digital marketing industry) so he already has an audience to sell to. He has a good agent. And the deal he’s been offered sounds highly lucrative. Most of us are not that well known and will find it difficult to get a good deal (or any deal) from an agent and/or publisher. So what should we do? Learn how to self publish a book using Amazon CreateSpace. CreateSpace offers an easy and cost-effective route to market. Who Am I To Talk About Self Publishing? How Much Money Can You Make From Selling Books? I’m Chris Fielden. I write fiction and run a popular writing blog. I’ve used the blog to conduct evergreen content marketing experiments and written about them on Moz. I run a humorous short story competition called To Hull & Back that offers the greatest literary prize in the known macrocosm. It does. Honestly. I’m not biased at all. Every year, I publish a short story anthology of the best competition entries. ‘How to Write a Short Story, Get Published & Make Money’. I use CreateSpace to make the books in print and electronic Kindle format and sell them through Amazon. Until the end of February 2016, I was Operations Director at Fat Media, an award winning digital agency in the UK. I left so I could work full time on my blog, writing fiction and publishing books. Hmm… easier said than done. But it is doable. You just have to plan it and be disciplined about writing and editing it. Something that addresses your market’s number 1 problem and helps them solve it. This won’t necessarily be relevant for fiction writers, although I would still advise fully understanding your target audience. But if you plan to write an informative, helpful ‘how to’ style book, it’s essential to understand what your audience want. I receive hundreds of queries about writing tips and publishing advice from my users. As I’ve had a lot of short stories published through competitions and in magazines, I decided to write a book, using my own short stories as case-studies so that readers could clearly see how I used the tips and advice in practice to achieve success. I invited competition judges and magazine editors to contribute to the book so readers gained more insight into why the stories were accepted for publication. In the book I talk openly about how much I’ve been paid for each published story. This deals with my audience’s number 1 problem and offers them helpful advice. No one else (that I’m aware of) has used published stories as case-studies, making my offering unique and valuable to my audience. To do this, you need to undertake thorough research. I knew this book would work because I’d been running my blog for three years before I wrote it. On average, in 2015, the site attracted 16,000 visits a month, mainly via organic search. My audience is a decent size. I engaged with them. I thoroughly researched what they wanted, mainly through exchanges with users via blog comments and email. I also looked at Facebook writing groups, Twitter, LinkedIn and writing forums to see what writers talk about. I attended local events and talked to people who like to read and write. I wrote the book, confident it would offer value to my audience – it would be something they might buy. The book is approximately 84,000 words in length. It contains lots of advice. It has helped writers become published short story authors. My head is swelling. I need a lie down. People like reading information presented in this format. They find it valuable. For these reasons, the same format works well for a book. When writing my ‘how to’ book, I looked on it like a long, informative blog post. I’d advise you do the same. It works. You can also follow this tutorial to learn how to do keyword research for your book. To prove the point, I will produce this blog post as a book while I go through the self publishing process on CreateSpace. Once you’ve written a masterpiece, you might then ask… how do I self publish and make it available for purchase? One of the easiest ways of doing this is by self-publishing a book on CreateSpace. When completed and published, CreateSpace will print your book on demand, producing a single book each time one is ordered online. You can sign up and use CreateSpace for free. For this example, I’m concentrating on books. This means you can sell your book easily without having to invest in any stock. But don’t worry about that now, I will cover that later on in great detail but in essence it only costs money when people actually buy your book. The first thing we need to do when self publishing on Amazon is to create the book itself. This is very easy to do and I have broken down all of the steps for you below. Login to CreateSpace and select ‘Add New Title’ from your member dashboard. You start by naming your project and selecting the type of project you want to create. 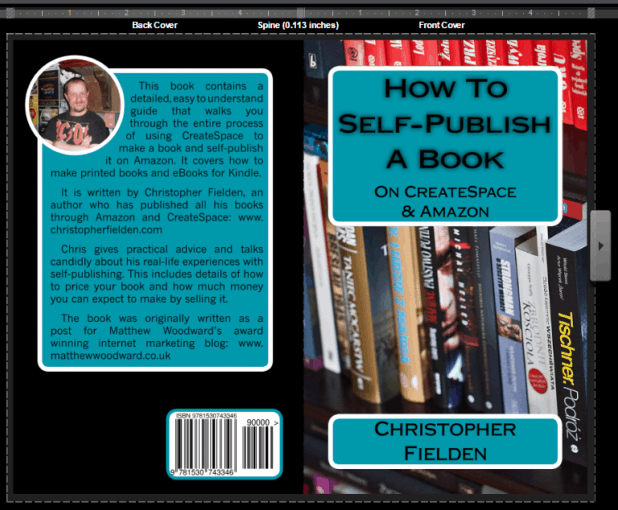 In this example I’ve named the project ‘How To Self Publish A Book On CreateSpace & Amazon’. Then I’ve selected ‘Paperback’ to make a book. I would recommend selecting the ‘Guided’ option the first time you use CreateSpace – it educates you on the creation process. When you’ve created one book, you can use the ‘Expert’ option as you’ll be familiar with it. It’s worth noting that it is easy to create an electronic Kindle version of the book after you have created the physical version for print. I will talk about that in more detail later. Click ‘Get Started’ on the guided option to get started. It’s important to make sure the title information you apply is informative and accurate. There are lots of fields to fill out here so I am going to break them down for you step by step. By default, the title is the same as the name of your project. You can alter it here if you want to. I always make the project title the same as my book title. So in this example, my title is: ‘How To Self Publish A Book On CreateSpace & Amazon’. This is optional, but I’d recommend using it. It will appear when you sell your book on CreateSpace or Amazon. The subtitle is a second opportunity to entice users to buy your book. The maximum length of the subtitle is 255 characters, including spaces. This book contains easy to follow instructions that show you how to self publish a book on Amazon using CreateSpace. Author Chris Fielden has self published many books. He walks you through the setup process giving lots of practical advice along the way. This subtitle is 254 characters (41 words) long. The only mandatory field is ‘surname’. In this case I have used my name: ‘Christopher Fielden’. I left the prefix, middle name and suffix blank (although I was tempted to put ‘Warlock’ in the suffix field…). Here you can add details of anyone who has contributed to the book. This can include illustrators, translators, writers etc. There is a list of around 70 options in the dropdown menu. Just pick the most relevant. In this example I’ve added ‘From an idea by Matthew Woodward’. This is because I originally approached Matthew about writing a post regarding how I grew the audience on my blog. Given my background, he suggested writing a post about self publishing on Amazon instead. So I did. There is a tick-box option to indicate if this book belongs to a series. You might use this if you were writing a series of ‘how to’ books or a series of novels, like J. K. Rowling did with Harry Potter. If you do select the tick-box you can give the series a title and then give this book a volume number. Volume numbers must be numerical (EG, 1, 2, 3 etc.). This can help readers find the next book in the series if they don’t know its name. I have not filled in this section, as my book is not part of a series. The first time you release a book, it will be a first edition. Therefore the edition number should be 1. Later, if you make substantial updates to the content, the edition number should be changed accordingly. This means readers know if they are buying the book in its original format or whether it is a later version with edits. In this example I have entered the number ‘1’ as it is the first time the book has been published. This simply indicates the primary language the book is written in. For this example I have selected ‘English’ from the dropdown menu. This indicates the date the book was first published. For new books, you should leave this field blank. The publication date will then be assigned automatically on the date you approve the book for publication. If you are creating a printed book, the publication date is highly unlikely to be the same date that you go through the setup process. It is advisable to order a printed proof to review, prior to publication and this takes about a week. I will talk about this in more detail later. If you are re-publishing a book, you can enter the book’s original publication date. In this example I have left the publication date blank as this is the first time this book will be published, so it will be assigned automatically. Once you are happy with all the title information, click ‘Save & Continue’. Put simply, an ISBN is a unique stock keeping identifier that allows your book to be distributed and sold. CreateSpace offers a good resource that explains the difference between the different options available. And this is a great post about ISBNs, written in language that’s easy to understand. I always use the free ISBNs provided by CreateSpace as they are quick, simple and FREE. You can go on and create your book without assigning an ISBN at this stage if you want to. But you will need to assign one before you can publish your book. If you want to undertake further research on ISBNs, there are links to lots of helpful resources at the bottom of the ISBN page on CreateSpace. In this example I’ve selected the free option. Once you assign the ISBN it cannot be changed. Click ‘Assign Free ISBN’. Two ISBNs will be created for your book – an ISBN-13 and ISBN-10. You can learn why two different ISBNs are generated on Wikipedia. Next you need to setup your book’s interior. This means creating everything apart from the cover. There are quite a few options here so let me break them down for you below. There are two choices – black and white and full colour. I always use black and white, despite featuring author photos in my short story anthologies. This is because full-colour interiors can be way more expensive to print. In this example on the CreateSpace forum, a full colour version of a 330 page book costs the creator $23.95. The same book in black and white costs $4.81. This is the base cost of printing, before any profit is factored in. I’d strongly recommend using the black and white option to make your book affordable. You can still have a full-colour cover at no extra cost. You can choose white or cream. There isn’t a right or wrong choice – this is completely subjective. If you can’t decide, you can order samples. Or you could just create two versions of your book and order a copy with white paper and a copy with cream to compare. Personally, I don’t think it’s worth the extra hassle and cost. I’ve always used white. It looks great. This is where you select the dimensions of your book when it’s printed. The default option is 6” by 9”, but there are lots of other sizes to choose from. Just click ‘Choose a Different Size’. Again, this is subjective. If you want to know what size would suit your book best, I’d recommend going to a book shop with a tape measure and seeing what size of book appeals to you. I have always used 5” by 8”. It’s popular. It fits on most bookshelves. It’s not so small that the page count becomes really high. I like it. Page count is an important consideration. A book’s print cost includes a price per page. CreateSpace has a really useful book order calculator that can help you make decisions about all these different options. As an example, my ‘how to’ writing book is 83,876 words long. Its trim size is 5” by 8”. The book has 364 pages. The print cost, for me as the book’s creator, is $5.21 per copy plus postage – the more copies you order, the cheaper the postage. So my cost per unit is around $6. The book I am creating as an example is 11,514 words. The book has 90 pages. The print cost, for me as the book’s creator, is $2.15 plus postage. I always use the formatted template. The title page, copyright page, dedication, contents, acknowledgements, introduction, chapters, correct margins for print etc. are already setup. It ensures your printed book will look its best, saving the faff and time of doing it yourself. The only thing I change is the font. It’s Garamond in the template. I prefer Calibri. This is completely subjective. Once setup, you can use your first book as a template for your second, which speeds the process up for your future books. I’ve always uploaded my own book file. Anyone who has basic knowledge of Microsoft Word can do this themselves using the templates that CreateSpace provide. If you have the budget, you can pay CreateSpace to set the book up for you. Prices start at $199. I’ve never used this service as I haven’t found it necessary, so I can’t comment on how good it is. In this example I have created the interior for the book myself. Therefore, I selected ‘Upload Your Book File’ and submitted the book’s interior as a Word document. You now have the option to Launch the CreateSpace Interior Reviewer. As you can see, the Interior Reviewer shows you print borders and accurately illustrates how the book will look on paper when printed. The reviewer also points out potential errors (EG, if your images are of low quality or your book’s formatting is incorrect). I always go through the entire book using the reviewer and then make any edits that might be necessary and upload the file again. At the end of this process, I strongly recommend ordering a printed proof of your book prior to publishing. The online reviewer is very good, but it’s still not the same as seeing the real book in your hands. That is the only way to review the print quality accurately. I will cover this in more detail later. When you’re happy with the look of your book’s interior, click ‘Save & Continue’. I’m not particularly artistic, so I usually have my book covers designed by talented artists. This is because a good cover makes your book look professional, it builds trust in your buying audience and good cover-art is appealing to the eye so it can aid sales. CreateSpace offer a professional cover design service. At the time of writing the prices start from $399. I’ve never used these services so cannot comment on their quality. Remember – the spine dimensions are dictated by the number of pages in your book. So, if you’re creating the cover independently, you need to complete the interior setup prior to creating the final version of your cover so you know how many pages will be in the book. If you get this wrong, your spine will be off-centre and look unprofessional. There is no limitation on the amount of colours for the cover – use as many as you want. Again, this is subjective. I usually order 2 proof copies of a book to see if I prefer the matte or gloss finish. To date, I have always published using a matte finish – I think the colours have more depth and the quality is better. But this is my personal opinion. For this example I have used a matte finish. I would usually upload a print-ready cover, supplied by an artist. In this example I have used the ‘Build Your Cover Online’ option. This is easy to use and CreateSpace provide some basic templates. The templates are good (fine for this example), but in my opinion they look like templates and your options are limited. Employing an artist to create a full cover can add a quality feel to your book and aid sales. You could also ask an artist to create the imagery and insert it into a cover template. These options will differ, depending on what is included in your selected theme. You can deselect some of the options (like ‘Publisher Logo’ for example) if you don’t want them included. There is a fairly extensive image resource in CreateSpace, so you can use their images on your cover for free. Or you can upload your own. In this example, I have uploaded an image I found on Pixabay that is free to use commercially with no attribution required. I tend to use imagery that supports the subject matter of the book – hence an image of books on a shelf in this example. This can simply help browsing users identify your book as something they might be interested in and aid sales. This book contains a detailed, easy to understand guide that walks you through the entire process of using CreateSpace to make a book and self publish it on Amazon. It covers how to make printed books and eBooks for Kindle. Chris gives practical advice and talks candidly about his real-life experiences with self publishing. This includes details of how to price your book and how much money you can expect to make by selling it. Once you are happy with your cover, click ‘Submit Cover’. Then click ‘Complete Cover’ and on the next screen click ‘Save’. Job done. You are now ready to complete the setup of your book and submit it for review. The review process takes up to 24 hours. CreateSpace will check that your book’s interior and cover are formatted correctly for print. You will be notified by email when the review process is complete. If there are any problems, they will be highlighted. You can then review them, make any necessary edits and resubmit the file. Each time you resubmit files, it takes up to 24 hours for the files to be reviewed and approved. Once you have completed the setup process, you need to proof your book before publishing it. Firstly, take note of any potential issues highlighted during the review process. It is very important that you proof the book and take care of these issues before self-publishing on Amazon. In the screenshot above, you can see that a warning about image quality was highlighted after my files were reviewed. This is a fault I encounter regularly through the short story competition I run. This is because I can’t always get decent quality photos from the winning authors featured in the anthology – sometimes they aren’t tech-savvy enough to give me what I need. CreateSpace advise using images with at least 300 DPI (dots per inch) to make sure the pictures print clearly. I have found that even images under 200 DPI usually print well. I’d just advise using the highest quality images you can. In this instance, some of the screenshots I used are below 200 DPI. I decided to order a printed proof of the book and review how they look before publishing. They will probably look fine in print. The Digital Proofer is the same as the Interior Reviewer described earlier. This time, your cover will appear in the reviewer as part of the book. This gives you an idea of how it will be trimmed during the printing process. You can also download a PDF proof of the book. The PDF will not contain the cover, but allows you to review the rest of the interior. Both the digital reviewer and the PDF proof are useful. They will help you spot errors. However, as I mentioned before, I strongly recommend buying a printed proof to review before publishing your book. This is very simple – it’s like using a shop. Well… it is using a shop. I won’t insult readers’ intelligence by going through it step by step. Simply order a book. In this example, the proof cost $2.15 plus postage. OK, postage is worth a mention. You will be presented with three options. Two of them are somewhat archaic and remind me of delivery times available in ancient history. You might as well strap the book to a raven and see what happens. I always go for the fastest delivery time possible. OK, you have to pay extra postage costs, but I’m usually working to a deadline and need to get the job done. Once you have received the book, read it. The whole thing. You’ll be amazed how many errors you find. For some reason, I always pick typos up better when reading words in print than I do on a computer screen. I then fix typos and errors, resubmit the updated files and go through the review process a second time. Unless there were any major problems with the printed proof, I just use the digital proofer the second time round. In this example, the book’s format was fine and the images looked OK. I simply fixed typos and resubmitted the book. This option approves your proof for publication. In this example, the second time round I was happy so I approved the proof. This option takes you back and allows you to make changes to the interior and cover. If you click the ‘Change’ button, you HAVE to go through the review process again. I used this option the first time I went through the process, after receiving a printed proof of the book. Once your book is set up, proofed and ready to release, you need to decide how to distribute and sell it. You can set this up while your book is going through the review process to save time later. The Amazon options simply make the book available on all their country-specific websites (EG, Canada, France, Germany, India, USA etc.). The CreateSpace eStore allows the book to be purchased on the CreateSpace website. I always sell books through as many channels as possible. To my mind, the more readily available your book is, the more exposure it receives. This creates more opportunity to generate sales. However, it is worth noting that if you sell through expanded distribution, the minimum price threshold for your printed book will be higher. This is because the printing and distribution costs increase when more companies are involved in a sale. This does not mean you can sell the book at a lower price through the first three sales channels and make more money per-unit. It just means customers can buy the book at a lower price. I’ll talk about this more in the pricing section below. ‘Libraries & Academic Institutions’ is self-explanatory – it makes the book available through libraries, schools, universities etc. ‘CreateSpace Direct’ allows CreateSpace certified resellers, like independent bookshops, to sell your book. To enable ‘Book Stores & Online Retailers’, you have to setup a BISAC (Book Industry Standards and Communications) code. This is a code that identifies your book’s subject matter and categorises it. You can learn more about BISAC codes here. To set this up, click on ‘Select a BISAC code here’ or go to ‘Description’ in the left menu (both links take you to the same page). I talk though this process in ‘BISAC Category’ below. For some reason, CreateSpace seem to have the order of this part of the process a bit backwards, so you just have to do it in the wrong order. For the sake of consistency, I’m talking it through in the same order it appears in the main menu. Once you have completed ‘4. Description’ simply select that channel and then click ‘Save & Continue’. There are two links on the ‘Channels’ page that allow you to setup discount codes and your CreateSpace eStore. The Discount Codes option is self-explanatory – you can create discount codes that can be applied to all your books on this page. You can read a recent resource about CreateSpace discount codes here. The CreateSpace eStore allows you to setup an eStore on CreateSpace that you can direct your customers to. It’s very simple to use. You can learn a lot more about the eStore here. You do NOT have to setup discount codes or create an eStore when self publishing on Amazon. The pricing process is very straight forward. CreateSpace tells you the minimum price you can sell a book for. This is based on the selections you have made during the setup process and includes print and distribution costs. They then calculate your royalties in different currencies as you alter the sale price. Far more detail can be found on the CreateSpace royalty advice page. This resource covers royalty splits with retailers and the costs of print in different formats and countries. You can also use the CreateSpace royalty calculator. The minimum list price for this example book is $5.38. This includes printing and distribution costs. If I set the price at $5.38, I would not make any profit when selling through Expanded Distribution channels. I have selected the tick boxes that suggest GPB and EUR prices based on the USD price. This means that the prices of books in different countries will alter as currency exchange rates fluctuate. With my other books I do not do this. This is because I want to offer a set price for my books in the UK to match with my marketing efforts. If the UK price changed every time the exchange rate altered, it would be very difficult to offer consistent pricing information and discounts when advertising. So you can see a clear example, here is how I price my book ‘How to Write a Short Story, Get Published & Make Money’. Amazon also makes the book available in many other countries, like Canada for example. The price the book is sold for in other countries is based on the USD price of the book and, to the best of my knowledge, can’t be altered. As an example, take a look at the page for my book on Amazon in Canada. In my opinion, if you are offering a book that contains lots of information, value, entertainment, etc. you should not sell it too cheaply. It should be priced based on how much work went into it and how much the buyer will gain from it. Do NOT undervalue your product. To put this into context, ‘How to Write a Short Story, Get Published & Make Money’ took me six years to write. There was a lot of research involved. I needed to take time to gain the relevant experience to write the book in a way that would offer value. I dread to think how many hours went into it. Therefore, I believe it is priced reasonably. As the book in this example ‘How To Self Publish A Book On CreateSpace & Amazon’ was not written with profit in mind, I have kept the price low. It’s just an example and the majority of the book’s content will be available for free online on Matthew’s blog, so it seems unreasonable to charge a high fee. The distribution methods you select can alter the minimum price you can charge for a book. In this example, I can price the printed book from as low as $3.59. If I now select and enable all the Expanded Distribution channels, the minimum list price for this example book would be $5.38. The more astute among you will have noticed that this gives me exactly the same royalty amounts as not having Expanded Distribution channels selected. This is why I always use all the distribution channels available. Why would anyone not want to use all the Expanded Distribution channels? Well, a writer might want to offer their book to family and friends at the cheapest price possible. Or an author might have developed a marketing plan that offers the book at low rates to a huge email database, so they might want to concentrate all their efforts on selling directly to that audience at a low price/high volume. There are lots of potential reasons. Personally, I like to make my books as widely available as possible, so I use all the channels. It’s worth noting that selecting ONLY the CreateSpace eStore channel is the cheapest way to sell your book. In this example, you could sell it for as little as $2.69 but you’d receive zero in royalties. I already selected the cover finish earlier in the process. In this example I selected matte. This option appears here to make it easy to order proof copies of the book with a matte or gloss cover without having to go back through the review process. This part of the process sets up all the information for the sales page. It allows you to add more detail for prospective customers to help them decide if they want to buy your book. You can also add tags to help people find your book when searching on Amazon. The description for your book can be up to 4,000 characters in length. It will appear on the sales page in online shops. You could use the blurb from the back of the book, but this is your chance to give prospective customers more information and entice them to buy your book. This book contains a detailed, easy to understand guide that walks you through the entire process of using CreateSpace to make a book and self publish it on Amazon. It covers how to make printed books and eBooks in Kindle format and contains links to many useful online resources that can help you research the implications of choices made through the creation process. It is written by Christopher Fielden, an author who has published all his books through Amazon and CreateSpace and runs a popular writing blog that offers lots of free resources for short story and fiction writers. Chris gives practical advice and talks candidly about his real-life experiences with self publishing. He includes details of how to price your book, how much money you can expect to make by selling it and gives his expert opinion on the different decisions you will have to make while creating your book. Chris also talks about the pros and cons of using Amazon and CreateSpace to publish and distribute your books. The book was originally written as a post for Matthew Woodward’s award winning internet marketing blog. Matthew asked Chris to write a post about publishing books on Amazon for his audience. To do this, Chris had to go through the publication process to create examples readers could learn from. So this book was created for that reason. It is sold at a cheap price as it was not originally created to make money – just to be an informative resource for other writers and entrepreneurs to learn from. This example is 1,496 characters in length, which equates to 255 words. Amazon and CreateSpace do not allow you to include URLs in descriptions, so I have not used any. You can see all the rules for product descriptions here. Selecting a BISAC category is easy – simply use the dropdown lists. There are 100s of them. You will need to look through them and select the one that is most relevant to your book. You can also enter a BISAC code, if you already know it. In this example I have selected ‘Language Arts & Disciplines / Publishing’. The author biography can be up to 2,500 characters in length and displays on your book’s sales pages. I always try and use an author biography that is relevant to the book I am publishing. In this example, I need to show that my expertise qualifies me to write about the subject matter of the book. I was born in the 70s, which is too long ago for my liking. I played drums in a rock band for 15 years and was fortunate enough to tour all over the world. After the band stopped being a profession and became a hobby, I worked as Operations Director at an award winning digital agency in the UK. During this time I started writing fiction. I self published my first book, Wicked Game, in 2010. I used Lulu to create the printed book and CreateSpace to make the Kindle version of the book to sell and distribute on Amazon. Since then I have had many short stories published through writing competitions and magazines. Due to my success with short story writing, I recently wrote and released a book called How To Write A Short Story, Get Published & Make Money. It uses my published stories as case studies, so writers can see how all the different tips and advice in the book were used in practice to achieve publishing success. I published both print and Kindle versions of the book on Amazon using CreateSpace. I run the ‘To Hull & Back’ annual humorous short story competition, which offers the greatest prize in the known macrocosm. Part of it is cash (the top prize is currently £1,000), but there is more… much more. You’ll have to check my website for full details. Every year I publish an anthology of the winning stories on Amazon, using CreateSpace. I run a popular writing blog. My website contains many free resources to help authors develop their short story writing and see their words in print. All the advice I give is practical and based on real-life writing and publishing experience. I have a lot of experience using different platforms to self publish my stories and books. I now publish all my books on Amazon using CreateSpace. This book was originally written as a post for Matthew Woodward’s award winning internet marketing blog. I wrote it as I thought other writers might find it helpful when considering self publishing their own work. This example is 2,083 characters in length, which equates to 369 words. Again, I have not used any URLs. Simply select the language your book is written in from the dropdown list. In this example I have selected English. Select the country you are publishing the book from. I live in the UK, so in this example I have selected United Kingdom. Search keywords are entered to help customers find your book when using Amazon’s search engine. So this is similar to old style meta-tags on websites. You can add up to five comma-separated keywords or phrases that will help people find your book. This is a tick box that you should select if your book contains content that is not suitable for minors under the age of 18. In this example I have not ticked the box as the book doesn’t contain anything that might not be suitable for children. If your book is modified for the visually impaired (EG, the font size is over 16 point), you can tick this box. I don’t generally use print that large – standard print is anywhere from 10 to 12 point – as using a large print size increases the amount of pages in a book and therefore the print cost. In this example I have not ticked the box. Click the ‘Save & Continue’ button when you are happy with your description. I told you self publishing on Amazon was easy once you know how! It’s fairly easy to publish a book in Kindle format on Amazon. CreateSpace offer this useful resource that talks you through the basics. You don’t have to publish on Kindle. However, I recommend that you do. Authors who publish on Kindle as well as in print open themselves up to millions of Kindle customers. If your book is on Kindle you are highly likely to make more money. So, click the ‘I want to publish my book on Kindle’ button. I always choose the first option. Then hit ‘Continue’. In theory, your book will look perfect on Kindle straight away. In practice, I’ve found it isn’t that simple. It’s still worth trying the first option as Amazon do make updates that improve their KDP services. Once your CreateSpace file is converted, you get to review your book in Kindle format and, if you’re not happy with the way it looks, you can upload a different file. So, I recommend trying this option first. If you are publishing a book that is in the public domain (written by someone else but the Copyright has expired) you select the first option. If you have written your own book then you own the Copyright (because you wrote it) so you should select the second option. You should also select this option if you have purchased publishing rights for a book written by someone else. I have selected this option for this example. If you want to learn more about copyright, Wikipedia is a good place to start. There is also a useful resource on the UK government website about the intellectual property office that has links to lots of information. Put simply, if you enable DRM you stop Kindle customers giving your book to other Kindle users. If you do not enable DRM, then Kindle users can share your book freely. Usually, I’d enable DRM. Kindle customers can still lend your book to other users for a short period of time (so they can see if they want to purchase it) or buy it as a gift for another user, but it stops your book being distributed for free. In this example, because the majority of the content is available for free online, I haven’t enabled DRM. Authors might choose to select this option if they are trying to get exposure for themselves and want the book shared as widely as possible. You must choose what suits you best. DRM options cannot be changed, so make sure you are happy with your decision before continuing. To continue, click ‘Submit my files to KDP’. At this point you will be asked to login to Amazon. To publish on Kindle you need to setup a KDP (Kindle Direct Publishing) account. You can do this easily using your existing Amazon account (assuming you have one – most people seem to…). If you don’t have an Amazon account, set one up. When you login, you will be taken to your bookshelf. Your book will be ready to review and edit. Click on ‘Continue setup’. You will be given the option to enrol your book in KDP Select. You can learn more about KDP Select here – it allows you to reach more readers and make more money on Amazon. If you choose to enrol your book in KDP Select, you cannot make it available in digital format anywhere else. I don’t enrol my books in KDP Select because I also sell the books in PDF format on my website. You will just have to decide if KDP Select is right for your book by researching it. Next, you need to check through your book details. A lot of this will be auto-populated from the information you entered in CreateSpace. Most of the details for your Kindle book will be copied over from you have created on CreateSpace. This field will be auto-populated from CreateSpace – do not change it. I have not changed the name in this example, so it reads ‘How To Self Publish A Book On CreateSpace & Amazon’. This does not auto-populate as it is not the same as the subtitle option on CreateSpace. The subtitle and title of your book combined can only contain 200 characters. You can learn more about KDP subtitles here. An easy to understand ‘how to’ guide by an experienced self published author. The combined length of the title and subtitle in this example is 127 characters (21 words). This self populates from CreateSpace. I have left it blank as the book in this example is not part of a series. I have left the edition number as 1 as it is the first time the book has been published. KDP is not a publisher – it’s a service that allows authors and publishers to sell their books on Amazon. So in this example I have entered my name ‘Christopher Fielden’ as I am self publishing. Again, this information is taken from CreateSpace so you don’t need to change it. KDP does not support the same contributors list as CreateSpace – there are nine options. Look through the contributor options and see if any of them are relevant to your book. As none of them were relevant for this example book, I did not add any contributors. Auto-populated. ‘English’ in this example. You cannot use your printed book’s ISBN for the digital version. KDP does not offer free ISBNs. You would have to purchase one. If you want to do that, there are loads of places that sell them. The Nielson UK ISBN Agency or the US official ISBN body are good places to start. I don’t usually purchase a separate ISBN for my eBooks. Amazon assign an ASIN (Amazon Standard Identification Number) which allows your product to be found. In this example I have left the field blank. This is Auto-populated from CreateSpace. You should not change this to publish on Kindle. This section has some extra options in KDP that are not supported in CreateSpace. The BISAC information auto-populates from CreateSpace. This can help potential customers understand if a book is aimed at children (or any other age group). For this example I have left it blank as I don’t think it’s relevant. Again, this is primarily used for assessing reading ability in children. In this example I have left it blank as it is not relevant to the example book. You can make your book ready for release as soon as you have approved it. Or you can make it available for sale prior to release. Some authors might choose to do this to help fund a writing project. In this instance I have selected ‘I am ready to release my book now’ as it is complete. This is auto-generated using the cover from CreateSpace. I wouldn’t recommend changing it. This section is all auto-populated from CreateSpace. The DRM options you’ve chosen will have been transferred. The book content file generated for CreateSpace will have been used to make a Kindle version of the book and it will have been spellchecked. I strongly recommend previewing your entire book. Sometimes formatting errors occur when using the automated process from CreateSpace to KDP. You have two options. You can use the Online Previewer, which is very similar to the one in CreateSpace. Or you can download the file and view it on your Kindle (if you have one). I always use the Online Previewer. In this example, I encountered quite a few formatting errors – one was on the first page. My copyright information was appearing on my title page meaning the conversion process didn’t work correctly. Unfortunately, I experience this problem every time I publish a book in this manner (sigh). I resubmitted it. Second time round it was fine. When you are happy with the way your book looks, click ‘Save & Continue’. If you have written the book you are publishing, you own worldwide rights, so select the first option. If you have purchased rights for the book you are publishing you must select the territories for the rights you own. In this example, I have selected ‘worldwide rights’ because I wrote the book. You can learn more about the two different royalty options here. The 35% Royalty option allows you to sell the book for less, but you only receive a 35% royalty in most world territories. The minimum sale price in this example is $0.99. The maximum charge using this option is a whopping $200. The 70% Royalty option means you receive more money each time an eBook is sold, but you have to charge more for your book. In this example, the minimum price is $2.99. The maximum charge is $9.99. You have to decide what works best for you based on your circumstances. I usually use the 70% Royalty option as that works best for me and my price point. In this example, I am using the 35% Royalty option as the book was not written with profit in mind and most of the content is available to read for free online. Once you have made your royalty selection you can start playing with prices in a list of world territories. I usually price the UK and Europe individually and then set all other world territory prices based on the USD list price. These figures will change, based on current exchange rates and tax rates in different world territories. There are lots of links to other resources on this page in KDP that will give information on pricing in different countries. This option allows you to sell the Kindle version of your book to customers that have already purchased your printed book at a reduced price, or for free. In this example, I have made the book available for free. This option allows people who buy your book in Kindle format to lend it to family and friends for free for up to 14 days. You can learn more about Kindle Book Lending here. In this example, I have allowed lending. Once you have reviewed Amazon’s Terms & Conditions, tick the box and then click ‘Save & Publish’. CONGRATULATIONS – not only are you a self published author, you have books available in print and in Kindle format – BOOM. However, there are a couple of cons to be aware of. Self publishing requires a lot of hard work. While the financial cost is negligible, the amount of time you have to sink into writing, editing, formatting, proofreading, marketing and sales is phenomenal. Don’t let this put you off. Producing a book is immensely rewarding. Selling books even more so. I highly recommend it. Some bookshops refuse to stock CreateSpace books[/wps_highlight ] This is because some people in the book-selling industry feel that Amazon is putting the traditional High Street bookshop out of business. I understand this viewpoint and am sympathetic to the situation. Despite this, I’ve still chosen to use CreateSpace and Amazon for my books. This is because I run a website. The vast majority of my audience find me through the website and I need to offer an easy way for them to purchase books online. Amazon and CreateSpace fulfil my business need. They allow my audience to purchase my books with ease from a trusted online shop. A few bookshop workers I’ve talked with advised me to avoid Amazon and employ a publisher for self-funding authors (a vanity publisher) so bookshops are more likely to stock your book. They said the print quality and book cover quality tend to be better. This is true, but it’s marginal. The quality of CreateSpace’s printed books is good. Also, while I’m sympathetic to bookshops, I feel those that dismiss Amazon are failing to fully understand the self publishing author’s point of view. Using a professional publishing service costs money, anywhere from £750 to thousands of pounds for a run of books. You then have to sell them yourself or pay the publisher to help you market and distribute your book. You can learn loads more about vanity publishers here. In contrast, using CreateSpace involves very little cost/investment, as you will have learned by reading this far. From this, I think you can see why I choose to use Amazon. I’d love to be able to have my books stocked in bookshops, but if using Amazon means a bookshop might refuse to stock my book, then that’s a sacrifice I’ll have to make. I would add that Foyles bookshop – in Bristol, UK – have been incredibly supportive to me as an author. While they won’t stock the books I publish through CreateSpace, they have allowed me to use their shop for book launch events and are very accommodating. They like to support local authors. The last thing I want to do is paint a bad picture of shops, or online retailers for that matter. I simply wanted to make authors aware of the situation in the industry at the moment so they can decide what works best for them. Due to my website, online retail is best for me. Physical books in shops might be better for other authors. You just have to decide what works best for you and your situation. I believe the potential of how much money you can make from selling books is huge, especially from electronic copies where the production cost is minimal. How much do I make from selling books? I made £420.85 over 6 months. Not as much as I’d like. Yet. Here are my book revenue figures broken down over six months. This is the amount I received in my bank account after all the Amazon and CreateSpace costs had been deducted. These royalties came from print and Kindle books. Income from all currencies had been converted into GBP prior to me receiving the payment. Amazon pays royalties directly into my bank account at the end of each month. They usually come through in four to six separate payments, depending on which world territories the books were sold in. Why don’t I make more money (yet)? In my opinion, writing a book equates to around 20% of the work required to make money from writing. The other 80% of the work is marketing the book and selling it. I’ve written a book aimed at my target market, published it and distributed it through CreateSpace and Amazon. So, that’s 20% of the work complete. Through these efforts, I reckon I’ve done another 10% of the work required (remember, I only left my day job at the end of February 2016). As you can see, there is a lot of work still to do. But I’m confident it will generate more sales and pay off in the long run. I currently sell books and those sales figures are increasing year on year. What I’m doing is working. Maybe I’ll write about that in more detail at a later date, when I am further through the marketing process. Writing this post and creating the example book ‘How To Self Publish A Book On CreateSpace & Amazon’ took approximately 100 hours. The post and book are around 11,000 words in length. While the writing and creation process was fairly intense, this shows what you can achieve if you put your mind to it. Most books would take longer to produce. In contrast, as I already mentioned, my book ‘How to Write a Short Story, Get Published & Make Money’ took six years to research and complete. But the publication process offered by CreateSpace is quick and gives authors an easy route to market. So now you know how to self publish a book on Amazon, what are you waiting for? Anyone can start self publishing on Amazon today! I’ve tried to address all the potential questions writers might have along the way. I’m sure I’ve missed many… luckily there’s a comment form at the bottom of the post. I will do my best to respond to any questions or comments in a timely manner. Thanks Chris for sharing this great article , I never knew about CreateSpace and will definitely try it out. Please let us know if you publish your own book! Nice to see you on Matthew’s blog! Let me tell everyone that Writing and selling an ebook is a no easy task. You have very well defined all the steps we need to take to become a successful seller but but what about the promotion methods? A part from listing it on Kindle, what are the successful strategies you think we can work on? I agree, promoting and selling the book is challenging. I’m currently exploring the best ways to do that. The way that seems to be working best at the moment is giving away the opening section of the book for free (12,000 words, so full of valuable content) so readers can see if they like it. By doing this, I gain emails for my database. I then send out discount codes to people who have ordered the free download. This is resulting in more sales. It’s early days at the moment, but it does seem to be working. In addition to this, I am also experimenting with Facebook ads as that’s a good platform for my audience. If/when I have that working, I’ll also try Twitter & LinkedIn as lots of writers use that a lot too. Give me a year and I’ll write all about that as a follow up! Great resource. Do you think it is a good idea to compile an awesome, detailed case study into a book? Actually, I want to share my journey of making $10k/month from nothing through niche sites as a case study. I talked to my audience to find out what they wanted. There wasn’t anything out there that used published stories as case studies, so that’s how I decided on main theme/idea for the book. Due to doing a lot of proofreading, running a short story competition and writing a lot of successful short stories, I’d gained a lot of expertise in best writing practices and had lots of hands on, real-life experience to share that I knew others would find valuable as I was asked about them a lot. The research took a while – I already had a lot of stories published, but I needed more to gain examples of all the advice in practice. So I wrote a lot and liaised with editors and judges to get all the information I needed. Then I wrote the book. I planned it out like I would a blog post – I don’t undertake loads of planning, I simply break the post down into chunks with headings – and then I was very disciplined about making myself write the book. That’s the hardest bit really. You have to set time aside and stick to it. Discipline, focus and determination are key. Then I self-published. I didn’t bother with submitting to agents or publishers as I planned to market this to my audience myself. That’s a very terse explanation of the process. I will write about it in more detail at some point. My buddy just finished writing his book, it’s in the editing stage. This is perfect resource to share with him. LOL uncanny timing. Hey Chris, I’ve drafted a children’s story in CreateSpace, but I need illustrations. How do I find someone who can do this, and do you have recommendations on how I should budget for this service? Illustrations are very subjective, so I’d recommend researching artists until you find someone who you feel has the right style for your story. I usually turn to Google (you may have heard of them… :) ) as there are lots of artists with their own websites, or companies that deal specifically with illustration. You could also try Fiverr and People Per Hour. I can put you in touch with the artists I’ve used in the past if you like. Just drop me an email as chris at christopherfielden dot com. Budget wise, I’d just research the artists you like and then approach them for prices. It all depends on how much work is involved and how much individuals charge. One thing I would say, is give the artists a decent brief, with as much detail as possible. That way you end up with the end product you want. May I suggest you focus on the one thats nearly done to get it over the finish line! Hi Abdul. 2 books at once is quite an undertaking, but not unheard of. Some writers find they are more productive working 2 simultaneous projects as the variety inspires them. Still, like Matthew says, if you have one that’s 80% complete, it’s time to finish it and get it out there. That way you can split your time between marketing book 1 while writing book 2. That’ll grow your audience so the 2nd book will be even more successful! Oh thank you Sir for the reply and advice. I was actually beginning to focus on the one less complete and even wanted to start a third in fact i already wrote the script for the third. But i think i would just take your advice finish up with the one most complete so i know i am done with that. No problemo mi amigo, yo gusto usted blog porque es muy bien para mi espanol practica! If you are thinking about coming to Spain to practice your spanish let me know. I am living in Alicante, coast city like Marbella but still some Spanish people around here Hahaha… even though crowds of tourists in summer time like Marbella, I guess you will be able to practice your Spanish for sure. Very true, Max. I am slowly learning and experimenting with strategies that generate more sales. When I have that sorted I’ll definitely write about it. Fantastic article and very detailed but man the cover of your book is ugly as hell. It looks like it was purchased from fiverr.com or you whipped it up on photoshop. Im not trying to be nasty, im just giving you my opinion. If I were browsing AMZ looking for a book on this subject, I wouldnt even look twice at your book due to the cover. I suggest you hire a professional designer (or if this was produced by a pro designer, I suggest you fire him/her) becuase as the old saying goes, you get what you pay for. I normally pay around $200 for my covers. Hi Alex – LOL, I totally agree, and have said exactly that in the section about cover design in the post. For this example I simply used a template in CreateSpace so readers can see what the templates look like. I’m no designer, hence the cover doesn’t look good. For my other books, I ask professional artists to design the covers and they look much better. A great cover is very important for sales. Great article! I have found CreateSpace a fantastic way of publishing. I have written four networking books, three of which were at a relatively high level, but the fourth one has been written for beginners. in terms of Kindle publishing I wrote my first book on Kindle first, as a toe in the water, using HTML code in Sigil. For the second I tried CreateSpace’s publish to Kindle, but because of the networking commands used inside, much of this was lost, and I quickly pulled it from KDP, and used KDP’s Academic program, which can use a PDF as a source, but this does limit the devices that can read the end product. But if you have a lot of heavily formatted content, this does keep it truer to your original. If publishing on Kindle, you also need to take into account the size of the file. I could not publish my latest book (CCNA and Beyond) at 70% royalty, as if I priced it at $9.99, I would actually end up owing Amazon money! So this is something to bear in mind of publishing on Kindle. Great extra tips Stuart thank you! Such a great in depth review of the process, and very well timed for me. I have started to write something in the hope of self publishing, and if I can do it once, will be the start of a series. Fingers crossed! Please let us know how you get on Paul! Great stuff, good luck with your book Paul. Chris, absolute gold. More info on how to rank the books and the strategies for basic ecommerce would be awesome. This would have taken you hours to put together. Thanks. Thanks, Nev (sorry, must have missed this comment in May!). I’ll consider that topic for a follow-up post. Never heard of createspace, so that’s something for me to look into. I have self published before but only to a niche audience, not on Amazon. How did you create the physical books? I finished my work before 5 days, and I was wondering how to show it to the world …. Great post – thanks for being so detailed. I followed this step by step as I uploaded my first book. One question remains for me though – how do you choose the book image that goes against your Amazon listing? This is really important to me. I have a 3d image of the book cover that I’d like to use…so far I can’t see where you can add this in the process. Also, what about showing interior pages? So far as I know, CreateSpace and Amazon use the book’s cover as the product image and you can’t change it. I’ve just had another look through the edit options in CreateSpace and Amazon KDP and all you can do is change the cover. I’m not sure how a 3D file would print, so I’d definitely get a test print of it before releasing the book if you do decide to try that. Re the interior pages – I think it’s best to show them. It means potential customers can read the opening of your book and see if it is to their taste. Assuming you’ve written something awesome (I’m sure you have…) the beginning should hook them in and make them want to purchase the full book. I give away the opening 12,000 words of my book via my website and it aids sales, so I’d recommend it. I hope that’s helpful. Good luck with your book. Thank you for this informative post with so many details, examples and cost breakdown! And what happens if I want to add some illustrations? Should they be resized according to the book size, or they will be resized automatically by CreateSpace? You’d have to input illustrations and size them when you set up the template for your book. So it’s something you would have to do when you prepare your book’s interior file. Or you could employ CreateSpace’s design services. One thing to bear in mind is that full colour printing can make a book more expensive to produce – black and white tends to be a lot cheaper. So having lots of full colour imagery could increase your print costs substantially. Maybe, I want read this tomorrow. Great post,It is helpful and informative..Thanks for sharing this post! Absolutely fantastic post, your instructions are so easy to follow. I’m initially looking at publishing just on Kindle, rather than createspace and wanted to know if you’ve written a step-by-step post on how to create a book on Kindle from scratch. Well there is no time like the present! I have just finished writing my first book and looking for a self publish platform. I’ve looked at CreateSpace and it seems great for US but not for UK. Do you have any recommendations for a similar platform for the Amazon.co.uk market please? Thanks for such a detailed post. Too often these how to guides just waffle but your post explains the nitty gritty and is very helpful. I’ve got one question about proofing. My novel has been professionally edited on Word. I am not sure what proofing adds if you are already sure that it is grammatically correct. Are we just talking about formatting the file to make sure things like all chapters start on a new page- that sort of thing. Any guidance you can give on the proofing process would be welcome. Hi Mark. Getting a printed proof allows you to see the finished product. It’s important so you can check the inside for formatting errors and make sure you are happy with the cover. Whether you’ve had the book professionally formatted or not, I would always recommend getting a printed proof. I just wanted to say a big THANK YOU for this. I’ve got a 3 part fictional novel series I wrote 13 years ago that has been put on an external hard drive and not been looked at in at least 10 years due to lack of publishing options (or so I thought). I have been thinking for weeks about “picking the pen back up” so to speak but nervous and VERY confused about self publishing (where to start, cost, how to do it, etc). This has convinced me to grab the opportunity, go back to those three to clean up and get that “pen” scribbling. You have given this 26 year old the confidence to give it a go, sincerely thank you so much for taking the time out to explain it so clearly and so detailed. What a brilliant n article. Will certainly check this out for my own use. Also have a friend. an artist, who has just completed a Graphic Novel and this would involve both colour and B&W illustrations. I presume this would be possible? Thanks for the brilliant walk-through. I’m thinking of taking the plunge, but a bit put-off by reading elsewhere about having to pay or deal with US tax regulations. Any advice on that matter? Thanks! Thanks, Matt, I’m not in the US. I’m British but live in Tokyo. Hi, do you know a way of self publishing a shorter book on create space? The minimum amount of pages seems to be 24. I have written and illustrated a children’s book but it’s only 10 pages long. Thanks in advance. So impressed that I’ve ordered a paper copy of your book. I have a load of teaching materials for A level Physics. I easily have enough for a book and I’ve published before, conventionally, where the publisher takes the lion’s share and then some. I want to include a disk of 3d software simulations of experiments with the book, this would be its USP actually. You can see them on my website. Is there any way of incorporating a disk? Or could I make a DVD available which would have the software on? Any advice gratefully received. I’m finding it hard to come up with a workable solution. In some ways a disk seems old fashioned. Maybe giving users access to downloads would work better and might be more flexible. What do you think? I also noted that you said you always went for black only, but the example further on used colour, the graph and table used blue. Is there an option for colour on some pages? Thanks for the great details; very helpful. I’ve finished my book(s) and about to publish; however, I’m confused about some things and hope you can help. 1. Should I add headers and footers in the Word doc. that will be uploaded or would page numbering be done by Amazon? 2. Does Amazon add any page in the book like we usually find with published books have a blank page, a page with ISBN and so on? If Amazon adds something, then the page numbering will get messed up.